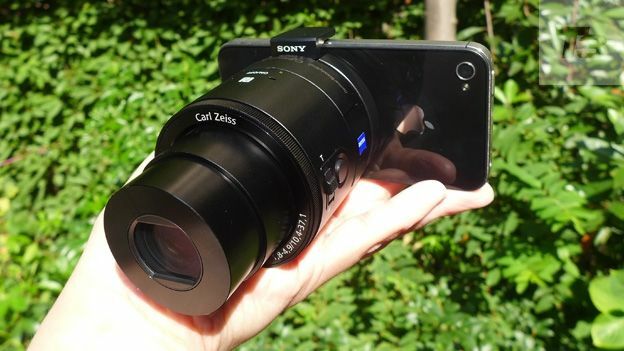 Is the Sony QX100 enough to replace your standard smartphone camera? Like it's lower-specced sibling, the Sony QX10, the Sony QX100 smart lens aims to supercharge your smartphone's imaging abilities. You can either clip it onto your handset or use it as a remote lens, snapping away from more interesting angles. The Sony QX100 is about the size of a standard lens from an interchangeable lens camera, so while it won't fit in your jeans pocket, it's portable enough to sling in your jacket pocket or a small bag. It won't weigh you down too much either, tipping the scales at 179g. In terms of colour, it only comes in black, and it feels reassuringly solid and well-built. You pair the Sony QX100 with your smart phone over Wi-Fi (or tap it, if your phone has NFC), but first you'll need to download the Sony PlayMemories Mobile app. This works on Android devices running Android 2.3 or later, and Apple devices running iOS 5 or later. Then just enter a password, and you're ready to go. Inside is a 20-megapixel sensor, which is way bigger than you'll find in most smartphones (apart from a few exceptions like the Nokia Lumia 1020, Nokia Lumia 1520, and the Sony Xperia Z1). So with most mobiles, the Sony QX100 will give you much bigger and better snaps, without having to invest in a digital camera. It also has a 3.6x optical zoom, for getting up close and personal with your subjects. One of the niftiest features is that it acts as a roving camera - just set it up anywhere, and you can use your mobile device as a remote shutter button. It has decent range too - you can set it up in the lounge, go to another room of the house, and still fire off snaps by using your mobile as a remote. You can screw in a tripod to the bottom too, and set a timer, so it's ideal for group shots. It can clip onto your phone if you want to turn your handset into a heftier camera, and the bundled wrist strap will save it hitting the ground if you drop it. It does make your handset heavier though, and we preferred using it as a separate, as it allowed for more creative angles. The Sony PlayMemories Mobile app is a doddle to use. Controls show up on your smart phone's screen, letting you zoom, focus, and more. Of if you prefer, you can twist the Sony QX100's lens barrel to zoom, and press the shutter button on the side to take a picture. It is quite slow. There's a second or two delay between pressing the shutter and the picture actually taking, and then it's another couple before the snap appears on your mobile. On the Android device we tested it with, photos are stored in the Sony PlayMemories Mobile folder in the Gallery app. You can share them from there or direct through Sony's app. It takes a few seconds to connect your mobile with the Sony QX100 too, and you have to do it every time you restart the app. If it's quick action shots you're after, youíll be better off using your phone's camera. There's no flash as well, so wherever you're snapping had better have some decent lighting. Image quality is very good, much better than the Nexus 4 we tested it with. Side by side, photos from the Sony QX100 are much crisper, and the grass way greener. It was also a wider angle, capturing more of the image either side, and with bags more detail on tree branches. Another niggle is the battery life. Sony says you'll only get 110 minutes before it needs recharging (via micro USB). Less than two hours shooting isn't long, especially if you're out on a day trip. Then there's the price. You could get a really good compact camera for £400, like the Canon PowerShot S120, or the Sony RX100, which has the same sensor as the Sony QX100. So to pay that much for an accessory seems a little steep. The Sony QX100 is a nice idea, and the results are certainly impressive. But unfortunately it's hampered by the lack of a flash, poor battery life, the high price and the sluggish performance. But if you've got money to burn and are after a new toy to go with your phone, it could be worth a look.